Here’s a simple metric to help you identify where to spend your time in 2018. It’s a simple idea, yet so easy to forget, or just ignore. This phrase has been an essential part of my planning and building of my business, and it’s helped me understand, as the CEO of my company, that I need to track metrics in order to fully understand how to improve. If I don’t track the data, how can I possibly understand what’s working and what’s not working? How can I improve? There was a time when I didn’t track data, which, in retrospect, is sort of mind boggling. I just kind of based efforts on a general feeling or on costs/dollars alone. Now, I track data. Lately, I’ve been more strategic with the numbers related to subscriber counts, website traffic, and conversion rates. I implement A/B testing in email marketing. I think about placement of links on SmartPassiveIncome.com. I try out multiple types of calls-to-action for online course sign-ups, and I pay attention to the numbers, one way or another. And with that, I’ve seen a noticeable improvement in the business overall. That’s great, but I am always mindful of the fact that each one of those visitors, each one of those subscribers, each one of those students is a human—a human with value and capacity for reason and love. When we’re talking about data tracking and analytics, it’s easy to forget that. They are humans, they are part of your audience, they are cherished members of your community. Treat them that way! Now, hopefully we all have goals for our businesses, goals that are defined, goals that we can measure and take action on. But to achieve those goals, there’s always a necessary component of change—starting, stopping, and continuing until we figure out the right path. Doing the same thing is likely only going to produce the same results, again and again. To better and more clearly define the different things you should be doing, you need to start, stop, and continue. So, what does that mean exactly? What does it mean to start, stop, and continue? I’ll give you an example. You have a big project launch coming up. In order to make the best out of this big project launch, you take time to determine what your goals are. After figuring out your goals, you look at your process. You figure out what you start doing to meet your goals, what you need to stop doing, and what you should continue doing in order to launch strong and achieve your goals. That’s start, stop, and continue. You start doing the things you determine you need to do to accomplish your goals. You stop doing the things that get in the way of the achievement of your goals. You continue doing the things that align with those goals. By dividing your efforts into those clear steps (start, stop, and continue), you are able to clearly define the new actions you should take, and the changes you need to make going forward. As always, business is a learning process, and this is the best structure that I found for understanding exactly how to take the next action. The origin of this start, stop, and continue process came out of a team meeting in San Diego. Matt and Mindy, of Winning Edits and part of Team Flynn, flew into town, and there, in a hotel room, the light bulb switched on. What we arrived at, is that in order to achieve our goals, we needed to have a plan that would be reflective and welcoming of change. On the hotel room window, we started by placing Post-It Notes with our goals and plans for the coming year. Pretty soon, we had a pretty extensive list of a) what we needed to start; b) what we needed to stop; and c) what we needed to continue doing. When we saw all of this laid out, it became very clear to us what actions we needed to take over the next year. What I love about this exercise is it creates boundaries. It’s like the saying, “if you say yes to something, you’re also saying no to something else.” Or, like the coaching strategy I learned recently, which is: when you’re coaching someone, you need to help them understand what they should be doing, but you also need to help them understand what they should not be doing. This is a great way to self-coach yourself into the actions that you need to take and hopefully get the results that you want. To help you understand why you’re doing what you’re doing. The great part about the Start, Stop, and Continue exercise is you’re going to find holes. You’re going to find areas that you didn’t realize you missed, or weak spots in your process. That’s a good thing! The exercise enables you to work backward to fill in those holes, and understand more clearly what the next steps should be. A book I highly recommend that goes perfectly with this strategy is The One Thing by Gary Keller and Jay Papasan. If you haven’t subscribed to my YouTube channel, please do. I’ll be doing a lot more video in 2018. Subscribe to my YouTube channel here! So, to get back to the Start, Stop, and Continue exercise, after you go through it, there may be many things you’ll realize you need to fix, fine-tune, or add. And, yes, that can be overwhelming. But the key is to take it one step at a time. Determine what your priorities are, and use that information to decide which ones need to be tackled first. That’s the Start: the the things you determine you need to start doing. When I was going through this process with the team, we decided to place a lot less emphasis on creating written-only blog posts (as opposed to blog post content that originates from videos or podcasts). A lot of what we are doing now is focused on YouTube and other platforms. It doesn’t necessarily mean it’s always going to be like that but, for right now, in order for us to meet our 2018 goals for YouTube, the podcasts, and our courses, we’ve had to stop creating blog posts that don’t originate from videos or podcasts. Now, this year, instead of Monday being my writing day, Monday will be my filming day. I thought critically about the Stop in order to Continue with a strategy that helps me better achieve my goals in 2018. Knowing that gives me the brain space I need to Continue—to fully focus on and commit to my goals of making video my number one focus this year. This also happened back in 2014 when AskPat was created. In order to make a five-day per week podcast work, I figured out that I needed to Stop actually editing all of the podcasts myself. So I built out my team to take over that responsibility so I can focus on making the podcasts as good as they can be. I couldn’t reasonably do that if I am spending all my time in podcast production. In addition to The One Thing, I also recommend checking out the book, Essentialism: The Disciplined Pursuit of Less by Greg McKeown. In it, Greg shares an exercise that’s very similar to the Start, Stop, and Continue approach. The essentialism approach asks you to rank the things in your life from 1 (least important) to 10 (the most important), which is important because our brains need that structure. Our brains are good at coming up with ideas, but not great at quantifying or grouping them. Writing them down and assigning values based on a number scale allows us to see things more clearly. When it comes to your business, are there things that you’d rank 1, 2, or 3? If so, those are the things you should Stop doing. The things in your business that may be ranked between 4-8, this is where the real progress happens. These might be tasks in your business you really love doing, and tasks that are important to your business, but maybe you need to find a better system, or find a team member to take over that task so you can focus on bigger things, the things that are 9-10. 1-3: These are the least important aspects of your business; the things that aren’t contributing to, or helping you achieve your goals. Get rid of them. 4-8: These are the things you really like doing for your business. They are important things, but they may not make sense for you to continue doing them the way that you’re doing them. Does it make sense? Does it align with your goals. Or can you assign to someone else? 9-10: These are the essential, must-haves for your business. They are aligned to your vision and will help you achieve your goals. The One Thing. Essentialism. Start, Stop, and Continue. 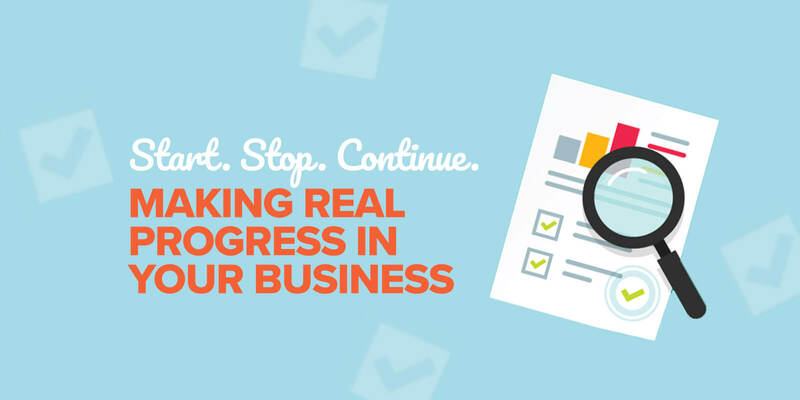 Each of these are methods to help you achieve real progress in your business. This is what I want for you. This is what you deserve. What’s really important in your business? What should you continue doing in order to meet your goals? Start to think deeply about your goals for this year. Work backward. If you find that you are doing things in your business that don’t help you reach those goals, maybe they need to be let go.